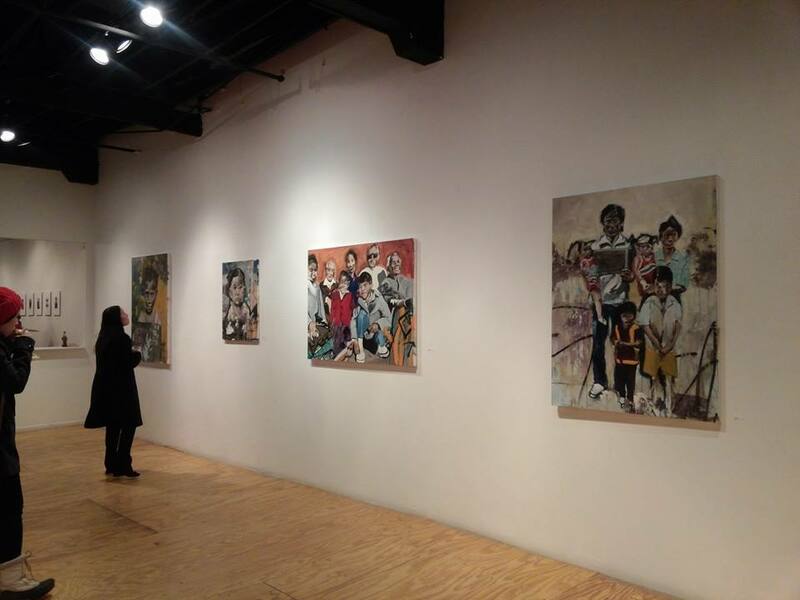 Did you catch our Lao Diaspora Project exhibit? In our first event celebrating 40 years of Lao American journeys, the opening night reception on a freezing Saturday, January 10th drew in crowds from the Twin Cities area. DJ Paradoxx spun homegrown beats with throwback to Lao classics. Award-winning artist, Chantala Kommanivanh, talked about his process in re-creating the art pieces from photo submissions. Mae Banlang Phommasouvanh, Lao PTA founder and youth educator, shared her life’s story through an illustrated book that her elementary school students self-published. Founding Editor, Chanida Phaengdara Potter, shared moments from the interesting conversations she had with Lao Diaspora, while collecting stories from Laos to Minnesota. Still need more reasons to go? Catch the acclaimed work of neo-expressionist artist, Chantala Kommanivanh. The pieces are truly reflective of an amazing artistic style that holds a blend of street art, mix media and boldness from a Lao American perspective. Many of the originals have been sold and will be going to their permanent homes after the exhibit is over. Catch a glimpse of them before they’re really gone. Browse a mini museum of Laos’ history from LLOTP’s archives. There are rare and somewhat unauthorized (Lao PDR-only) historical images that photojournalists of the Vietnam War era were allowed to capture. These were acquired through E-bay from media archival agencies. Some of the images included are from ‘samana’ re-education camps and inside refugee camps in Thailand. Did we mention poetry, sculptures, and storytelling portraits are also in the exhibit? LLOTP isn’t just a bunch of bLaoggers with something to say. The exhibit says something for everyone and is reflective of the many great Lao American artists in our community. Educate yourself a bit more about Laos, the Lao Diaspora right next door and our shared history. It’s not just about culture and the people. It’s also not just a sad and brown narrative. It’s our experiences on space, identity, and culture re-imagined into these galleries of pieces. Until any funding continues to make this exhibit happen again and on a bigger scale, this is it, folks. This is the first ever national exhibit that showcases the many perspectives and narratives on the experiences of the past 40 years of Lao Diaspora journeys. The exhibit is a mass showcase of everything and everyone. It doesn’t just include Lao Americans, but Lao Aussies, Lao French, Lao Canadians and even Lao Argentinians. It sparks the conversation about the past, present and future. It’s truly a unique and diverse visual essay. WHEN: Exhibition runs January 10-24, 2015 with gallery hours from 1:00pm-6:00pm daily (except closed on Sunday, January 18th, and closing Saturday, January 24th by noon). CONTACT: Chanida Phaengdara Potter or editor@littlelaos.org or call 612-460-5559. Learn more about the project here.